__ COLLEGE PARK PLAZA —The Woodlands, TX. 25 acre parcel and 70,000 SF strip center with pad site sales to Whataburger, Taco Bell, Taco Cabana, Walgreen’s and others. _ SADLER CLINIC—Acquired 3 acre parcel and constructed 42,000 SF build-to-suit medical office building for Sadler Clinic. Co-negotiated/sold project. RESEARCH FOREST PLAZA - PHASE I -Shenandoah, TX. 9.5 acre parcel and strip center (22,500 SF). (Phase 2)—3.1 acre parcel and 12,500 SF strip center with 1.4 acre pad site. Lowered financial risk of pad site sale to unknown restaurant through partnership with real estate investment trust. Leased 100% and sold project. _ ALDEN LAND DEVELOPMENTS - The Woodlands, TX. Under contract to purchase 2.1 acres with 19,800 SF single story, 2 building project. _TECHNOLOGY FOREST PROJECT—The Woodlands, TX. 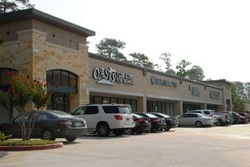 80,000 SF mixed-use development (20,000 SF retail center, 45,000 SF medical office building, and 2 pad sites).